Many people in local media were either not living in this area or are not old enough to remember the Federal Government undercover investigation into COLCOR (Columbus County Corruption) or the huge drug arrests made during the same time by another Federal and State Government investigation called Operation Gateway. SBI Director Haywood Starling said at a press conference in Raleigh back in 1983 that the operation involved seizures of 68 tons of marijuana and methaqualone worth an estimated 37 million dollars. COLCOR's success was largely due to the deep undercover work by FBI Special Agent Robert Drdak who's testimony to the Grand Jury led to the arrest of a long list of prominent Brunswick and Columbus County citizens. 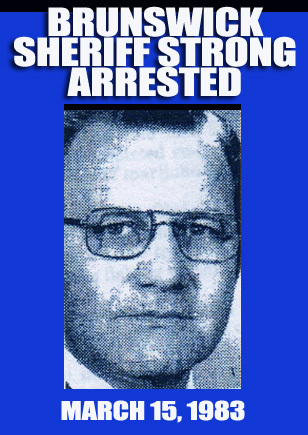 Brunswick County Sheriff Herman Strong (numerous charges of conspiring to smuggle drugs, providing protection to drug smugglers, accepting bribes and 2 incidents of drug smuggling marijuana and methaqualone tablets), Shallotte Police Chief Hoyal "Red" Varnum (conspiring to possess with intent to distribute 1,100 to 1,400 pounds of marijuana) and his brother Steve Varnum (a past Chairman of the Brunswick County Commissioners), Lake Waccamaw Police Chief L. Harold Lowery, (racketeering in connection with taking $1,650 in bribes for protection money), a former Columbus County Commissioner Edward Walton Williamson (who gave the undercover agent money to deal with Star News reporter Judith Tillman and send her back to Alabama), District Court Judge J. Wilton Hunt (racketeering and interstate gambling), State Rep. G. Ronald Taylor, (burning three warehouses belonging to another state senator who was Taylor's competition in the farm-implement business) Senator RC Soles (influence peddling, vote tampering, buying votes for District Attorney candidate Rex Gore, conspiracy to affect commerce by extortion), Lt. Governor Jimmy Green (charged with taking a $2,000 bribe and conspiring to take $10,000 in bribes a month) and an assorted cast of characters right out of some southern gothic horror film. Over 400 video and audio recordings of transactions and conversations between undercover FBI agents and defendants helped convince the Grand Jury of a need to hand down indictments on some of the regions most politically powerful people and their allies. Approximately two weeks prior to the arrests the Brunswick Beacon and the Whiteville Newspaper the News Reporter speculated about the Grand Jury and upcoming indictments. Other news outlets followed suit. According to Senior DEA Agent Mike Grimes "I've been an agent for the past 11 years and I've never seen anything like this," he said "The press beat me to the scene-there were helicopters, there were TV Cars, there were newspaper reporters - there were press people everywhere," Grimes said. "You might have thought the President was coming to town." With news of multiple subpoenas being issued to the current Brunswick County Sheriff Ron Hewett, his family, some deputies, DA Rex Gore and a few select individuals and businesses with dealings on his campaign, many are talking, actually whispering about upcoming BRUNCOR (Brunswick County Corruption) indictments. Whatever it is that is brewing up in the Federal Courthouse in Raleigh can't possibly equal the exciting Hollywood-like events from 1982-83. B-25 bombers landing in fields, dead bodies searched for in hog pits, fake kidnappings, Cuban smugglers, U-Haul trucks with 10,000 pounds of pot getting stuck in a ditch, fake drugs busts, and legislation enacted to make it illegal for the Federal Government to use money to influence a vote. Apparently Columbus County owes it's liquor by the drink to an undercover agent spreading around money. The current speculation is that Sheriff Hewett may have used taxpayer money to fund a piece of his campaign. For instance deputies handing out yard signs while on duty and using the office of Sheriff as an advertising vehicle in various media outlets, something at least two recent sheriffs have done in New Hanover County. Remember those tongue and cheek anti-drug billboards Sheriff Hewett had all around Brunswick County right at election time? That is the sort of thing being discussed at the Grand Jury Hearings in Raleigh, petty stuff like that is driving this investigation. A lawsuit was filed by someone who was not arrested for any crime connected to COLCOR yet he was implicated in an article published in the Wilmington Star News. The newspaper was successfully defended by 2004 and 2008 Presidential candidate John Edwards. RC Soles was successfully defended by famed Duke lacrosse attorney Joe Cheshire who viciously attacked undercover FBI Agent Drdak's truthfulness. Retired Agent Robert Drdak is currently one of the country's top Polygraph specialists and was hired by Cheshire to persuade Durham DA and Wilmington native Mike Nifong of his client's innocence. I was an adviser to Lt. Governor Jimmy Green when Green was arrested. Green was also found not guilty. "Whitey" Durham is One Tree Hill's Raven's basketball coach and also a father figure. Durham is played by actor Barry Corbin. James Walter "Whitey" Durham of Wilmington was sentenced to 21 years in Federal prison for drug smuggling. Durham is also believed to have shot and killed three Cubans that landed an airplane filled with drugs in Columbus County. Perhaps Rex Gore has enjoyed his many years of service along side of Judge Gore. Looking through a prosecutor's eys one can easily see why. Could it be the many poor minorities that have received "cash only" bail(not allowed by bondsmen or property)througout the years while they were confined behind bars, "innocent until proven guilty". A total disregard of NCGS 15A-531(4) as evidenced on the reverse side of the State's AOC-CR-201. "Green money only" this "outstanding student of the Law" as referred to by Rex Gore would order his magistrates. Ironically this was ordered during "pre" not "post" trial bail issues. Many can attest to the Honorable telling jailors, law enforcement officers and other personel to "call him no matter what time" should a defendant start to post a bond(which he(Gore) set". Gore would then on many occassions raise the defendant's bail per telephone with his magistrates. (A clear denial of bail and subversion of a constitutional right) Other's in the court system (many others) tell stories very similar like Judge Gore openly saying that "there is the law and then there is the way we do things". So to you Mr. Rex Gore I will say that there is always two sides and two different opinions as to the charactor of any figure. It is sad that this figure that you speak so highly of has did more to destroy the law in his 25 years of service than any other that comes to my mind. That's my story. Districts attorney sees effect of new GOP voters. You should see the castle of a house that the "former" student of the law and Rex Gore's friend lives in. Looks like Gore was never investigated for the Poker Enterprise his family has operated beside of him. The Gore Mansion is much larger than his friend Governor Mike Easley's home in Raliegh. Wonder how much corruption will now beset the DMV's office with the arrival of a "king pin" like Gore? If you want to know where alot of corruption is in this district, just look at Dennis Worley. Worley is the only attorney that gets anything he wants from the DA's office. Wonder why? Worley brags though not in public that he has the DA in his pocket. Right now, some media companies have better and more resources than some states!! It is a shame that people like this take advantage of the power they have when the people ispaying their salarys they should be ashamed of themselves very good post. The B-25 aircraft was named the REO Speedwagon. In 1980, while attempting to land at night in Brunswick County, an off duty Sheriff Deputy spotted it on its approach to a private landing field. The Deputy apprehended the three passengers and the plane was found to contain 5 tons of marijuana and 3 tons of Quaalude's. (the ground reception committee escaped) The pilot was a Major in the Thailand Air Force. The other two passengers were contract CIA. The aircraft was then deemed unsafe to fly and was left on the field. A week later it disappeared. It was found three years later on a hog farm in Columbus County.